Where to eat and sleep? 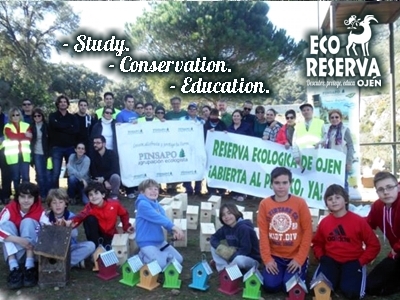 The ecological collective PINSAPO in collaboration with MONTEAVENTURA succeeded in converting a hunting Park into an Ecological Reserve in 2015, which is part of Red Natura 2000 as a Special Conservation Area (SCA). The Ecological Reserve of Ojén covers an area of about 82 ha. It´s a new concept of management and protection of Nature, settled in a privileged environment with a strategic orography and location between the Costa del Sol and the Natural Park of La Sierra de las Nieves in Málaga. In this natural sanctuary you will be able to learn and live an unique experience surrunded by the rich biodiversity of the Mediterranean mountain. In addition, we believe that the EcoReserva can provide another vision of Nature. As much to families and schools, as to tourists, in a privileged environment such Sierra Blanca, all the while boosting the local economy of Ojén. The objectives and actions carried out by the EcoReserva of Ojén are based on three elementary pillars, which are shared by the centers that are harbouring wildlife. These are principles that were established by WAZA. The EcoReserva aims to conserve not only the environment it occupies, but some specific species that require our help for their conservation. There is no point in conserving and protecting the wildlife if the message is not transmitted to others. Having animals and plants at hand in such conditions offers the opportunity to study them to learn more about them.